Pricilla wrote, "Maybe you can share your dieting methods which enabled you to loose that weight? What is your final goal?" I have lost 14 pounds so far. My goal is to lose 9 more pounds – 25 total. Three-fifths of the way to my goal, I noticed my face is thinner, my feet no longer hurt (yes, my toes are skinnier), my high heels are more comfortable for a longer period of time and my girdle is not killing me as soon as it did when I was 14 pounds heavier, in fact, the last few times out, my foundation garments were no problem at all. I started this diet in early November. On the eve of the holidays, I had lost about a dozen pounds. It was difficult to maintain that loss through the holidays, but I managed. New Year's weekend, I caught a stomach flu and when it was all over, I lost a few more pounds! I don't recommend losing weight by catching a stomach flu, but as they say, "when life gives you lemons, make lemonade." 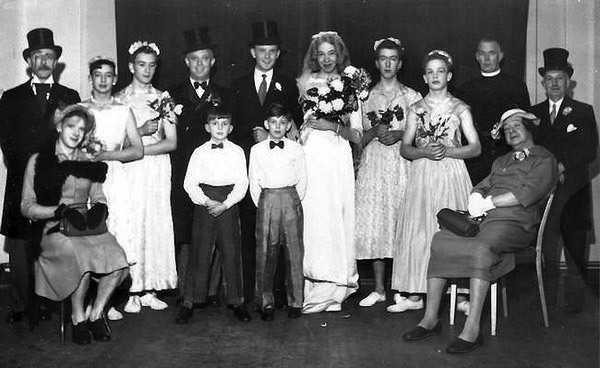 Seven femulators make a womanless wedding, circa 1950. I'm ok with cutting down on the sweets, but cutting out the carbs is so hard. I did join a gym that I can walk to at lunch, though, which I'm hoping will help get me in a better shape for spring.